parsing 0: Why did the chicken cross the road ? WRB   VBD  DT        NN     VB   DT      NN   . Why   did the     chicken cross the     road  ? wrote grammar to /tmp/example.rules and /tmp/example.lex. Note that the -s option should specify the root label of the trees in the treebank. To parse with large treebanks, it may be necessary to apply pruning, and it is useful to specify all the preprocessing steps and other configuration for an experiment in a single file. This can be done with the discodop runexp command. This will create a new directory with the base name of the parameter file, i.e., filename/ in this case. This directory must not exist yet, to avoid accidentally overwriting previous results. The directory will contain the grammar rules and lexicon in a text format, as well as the parsing results and the gold standard file in Negra’s export format. Note that there is an option to utilize multiple processor cores by launching a specific number of processes. This greatly speeds up parsing, but note that for a nontrivial DOP grammar, each process may require anywhere from 4GB to 16GB. Corpora can be read in Negra’s export format, or in the bracketed Penn treebank format. Access to the Negra corpus can be requested for non-commercial purposes, while the Tiger corpus is freely available for download for research purposes. Specify the option --numproc n to use multiple processes, as with runexp. 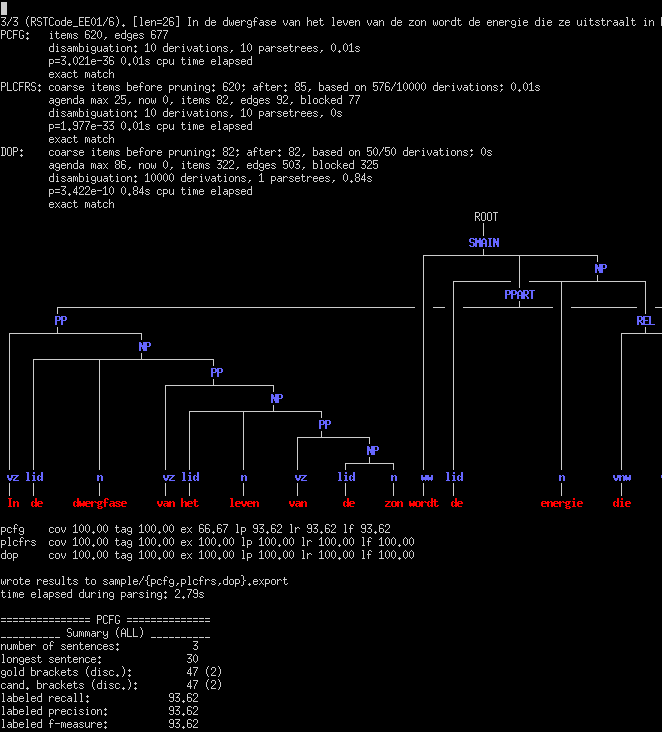 A command line interface to perform transformations on treebanks such as binarization. A command line interface to read off grammars from (binarized) treebanks. 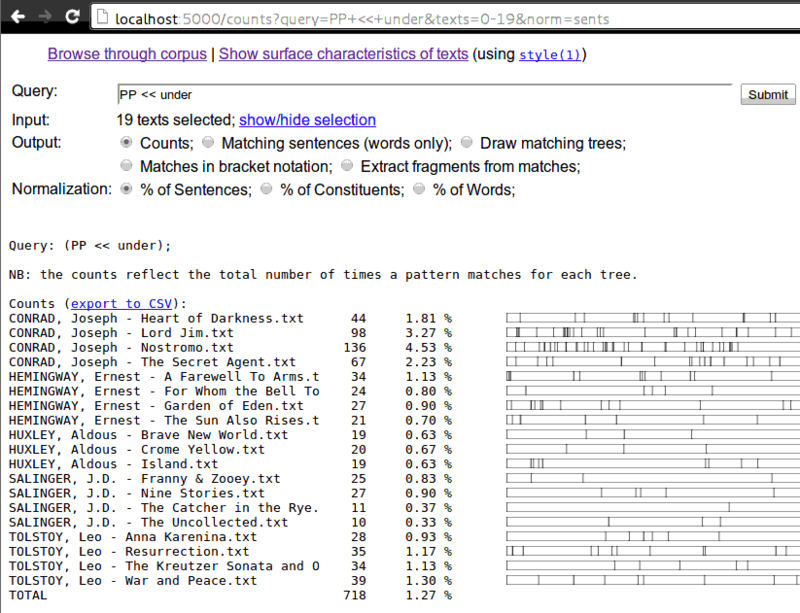 Search through treebanks with queries. A basic command line interface to the parser comparable to bitpar. Reads grammars from text files. Contains examples of various formalisms encoded in LCFRS grammars. An experiment in generation with LCFRS. For instructions, pass the --help option to a command or the links above. A web interface to the parser. Expects a series of grammars in subdirectories of web/grammars/, each containing grammar files as produced by running discodop runexp. Download grammars for English, German, Dutch, and French, as used in a forthcoming paper. A web interface for searching through treebanks. 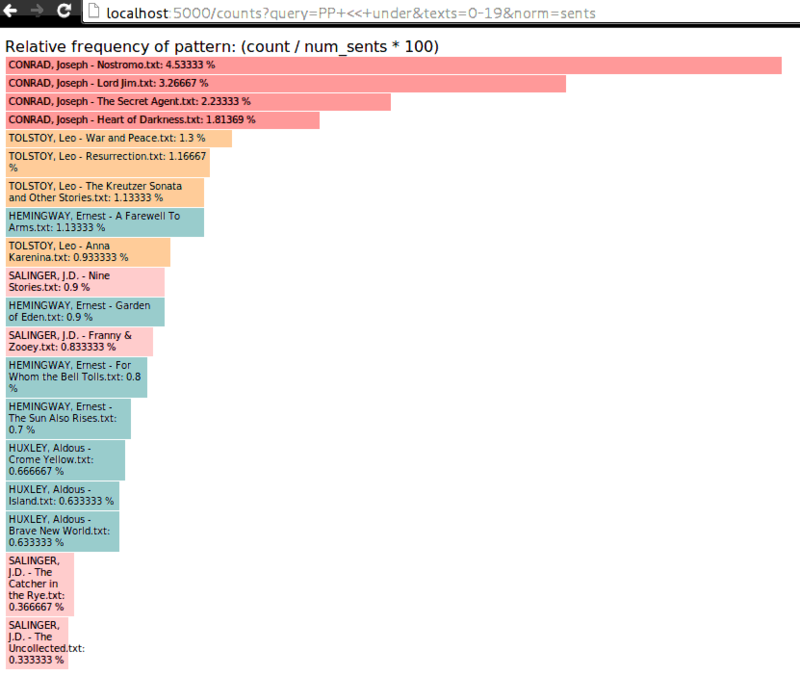 Expects one or more treebanks in the directory web/corpus/ (sample included). See the treesearch manual for instructions on corpus preperation. To enable basic authentication, put a text file web/treesearchpasswd.txt with lines of the form username: password (see the example file, only use over HTTPS). A web interface for drawing discontinuous trees in various formats.